Gather is my new favorite restaurant in the Bay Area. It showcases local, sustainable food in a very creative and delicious menu. The restaurant is located in the heart of Berkeley, across the street from UC-Berkeley campus. There is a warm open seating area around a central open kitchen, a bar off to the side, and outdoor seating as well. 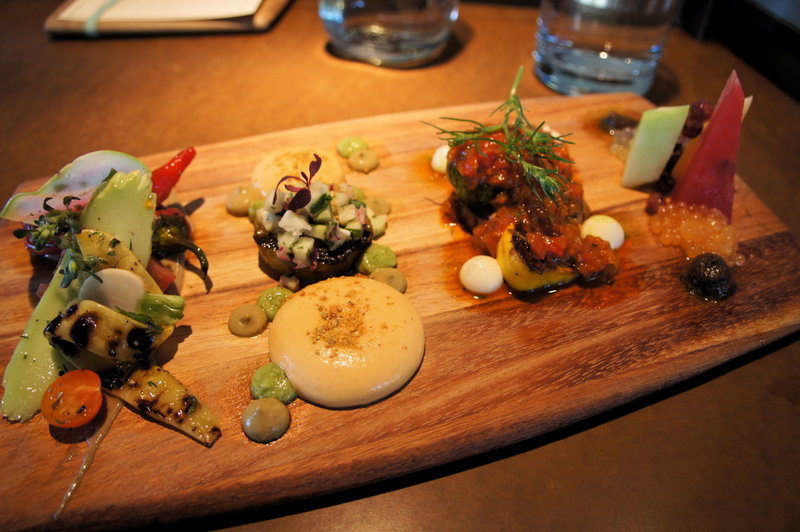 The vegan charcuterie ($16) is an incredible dish, with four different sophisticated preparations highlighting the possibilities of seasonal vegetables and fruits. The grilled Cetriolo heirloom tomato was the best tomato I have ever eaten. Beautiful heirloom melon with an interesting peanut shiso pesto. The roast chicken had well-seasoned, crispy skin and flavorful meat ($22). The goat milk semifreddo ($6.50) was creamy and rich and accompanied by a sweet, almost candy-like poached peach, fresh plum, and cashew crumble. There were so many other interesting dishes on the menu that I did not try but hopefully will soon. There is something for everyone of the menu, with a variety of vegan and gluten-free options, as well as seafood and meat. Service was both attentive and unobtrusive. For vegetarian dishes, Gather compares favorably with Ubuntu in Napa City, CA. Gather has won many well-deserved accolades, including Food and Wine chef of the year in 2010. Highly recommended. Sounds delicious! When are you going back? Joe and I may need to join you! I would go back in a heartbeat – anytime!